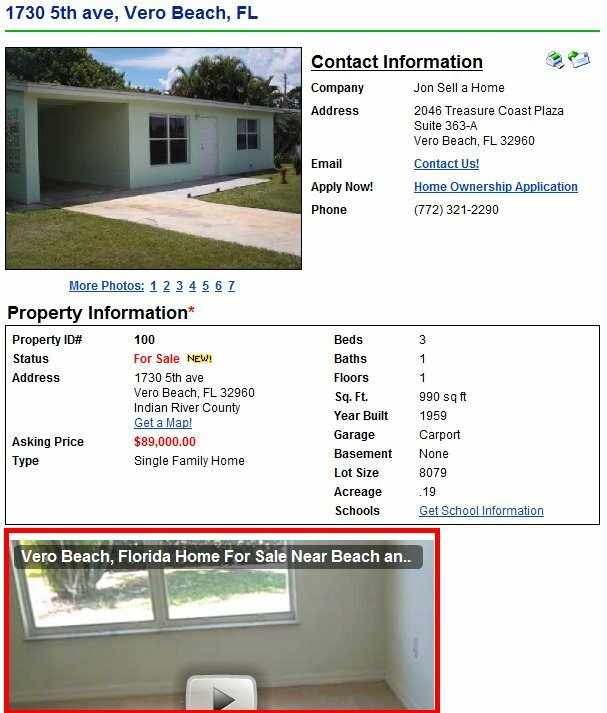 One of my good customers, Bob Bullinger asked if videos from Facebook.com, YouTube.com and other sources can be added to his Super Smart Sell Website Property Pages. The answer is "Absolutely!" We've had the ability to post videos to our Super Smart Sell Site Property Pages for several years now. There are two very easy ways to post videos to your Super Smart Sell Website Site Property Pages. To illustrate each method, I am going to use my good friend and customer, Jonathan Rexford's Super Smart Sell Site as an example. It is worth noting that Jonathan has our Super Smart Video Upgrade, but having this upgrade has nothing to do with your ability to add videos to your property pages. You will use this URL for Method 1 below... Adding a Link to Your Video or Virtual Tour. You will use this object code in Method 2 below... Adding an Embedded Video to Your Property Page. It is also worth noting that YouTube.com allows you to slightly customize the way your video will be embedded on your page. 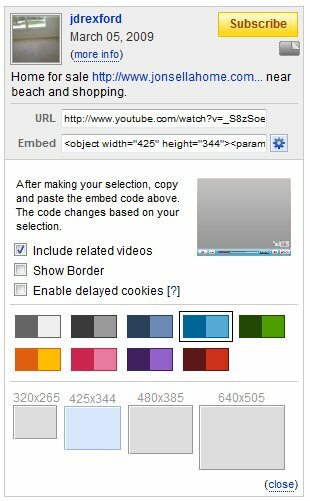 For example, you can choose to display related videos or not, show a border, choose colors and video size. See photo to the right above as an example of YouTube.com's customization features. Method 1: Adding a Link to Your Video or Virtual Tour - To add your video URL to your property page, login to your Super Smart Back Office Website and open your property detail page for the property that you want to add the video link to. Towards the bottom of the property page, you will see the "Optional Property Attachments, Audio Messages & Virtual Tour". The Virtual Tour is what you are looking for. It is highlighted in yellow in the photo below. All you have to do is paste your video into the Virtual Tour field and choose "video" or "virtual tour" (how you want the video labeled) from the pulldown menu and press "Update". It is that simple to add a video to your Super Smart Sell Site Property Pages. Add your video and label it as a virtual tour or video. Once you've added and updated the video link, it will now appear on your public version of your property page as a clickable video link. When the video link is clicked, a popup window will open where visitors can see your YouTube.com video. See photo below. See the clickable video link above and the video popup window. Method 2: Adding an Embedded Video to Your Property Page - The second method to add videos to your Super Smart Sell Site Property Pages is to actually embed the video on your property page in the description area. Using this method you will need to copy the YouTube.com object code mentioned above, login to your Super Smart Back Office Website and open your property detail page for the property that you want to embed the video into. Scroll down the page to the WYSIWYG HTML Editor for the Property Description. Switch the HTML Editor from the "Normal" tab at the bottom of the editor to "HTML" (See photo below). Then all you have to do is paste your YouTube.com video object code into the editor and press "Update" after you make any additional changes to the page. If you switch your editor back to the normal tab, don't be alarmed if your video does not play or load in the editor. This is often normal. Add the video object code to the editor using the HTML tab. Once you've added and updated the video object code to your property description, it will now appear on your public version of your property page as an embedded video that people can watch directly for your Super Smart Website. When the video link is clicked, it will start to play. See photo below. 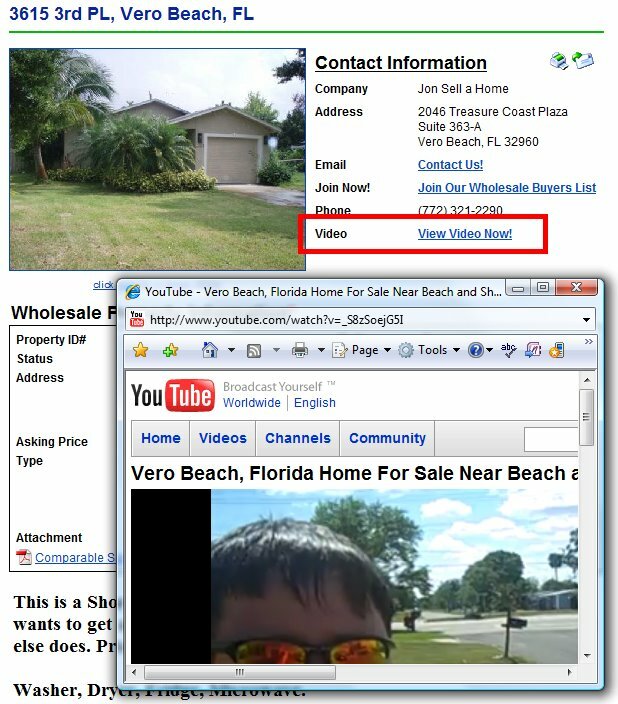 Here is an example of an embedded YouTube.com video on your Super Smart Sell Site Property Pages. 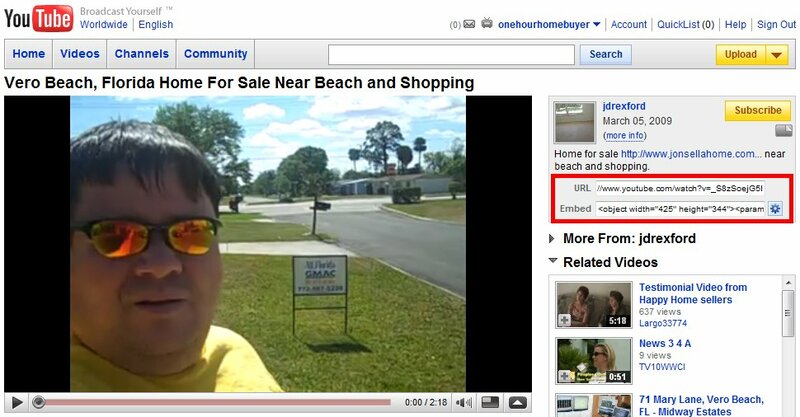 Adding a video link or an embedded video to your Super Smart Sell Site Property Pages is that easy! If you have any further questions about adding videos to your Super Smart Sell Sites, please open a Help Ticket at www.SuperSmartSupport.com with the Website Technical Support Department.